Cooked Pinot - How Do You Tell? Wineries continue to send me wine for review over the past few months despite the persistent heat here in Southern California where I live and points of origin in California and Willamette Valley. Some wines are sent by FedEx cold shipping or overnight which is probably secure, but other shipments worry me, particularly since insulated foam has been largely replaced by recyclable cardboard enclosures. I have been concerned that some reviewed wines may not be pristine examples of Pinot Noir. Extreme temperatures are not required to produce heat damage as temperature variation alone can oxidize wine. Temperature fluctuations can push air into the bottle (all corks allow some leakage of air) at a faster rate than will occur with a maintained temperature. It is well known that extensive heat exposure is detrimental to wine quality but how do you tell if a wine has been damaged by heat or “cooked?” I recently read an article about this problem written by sommelier Britney Campbell and published on line at huffingtonpost.com. She listed four ways to tell if you have a heat-damaged wine: (1) a stubborn cork - when the wine heats up, the cork expands and may be very hard to extract or may have pushed itself partially out of the bottle neck (see photo); (2) a warm bottle; (3) baked wine - fruit flavors taste stewed, baked or burnt as the wine oxidizes and color may have changed to a brown or brick tone for Pinot Noir; (4) flat wine - the wine has lost its fruit character and aromatics. 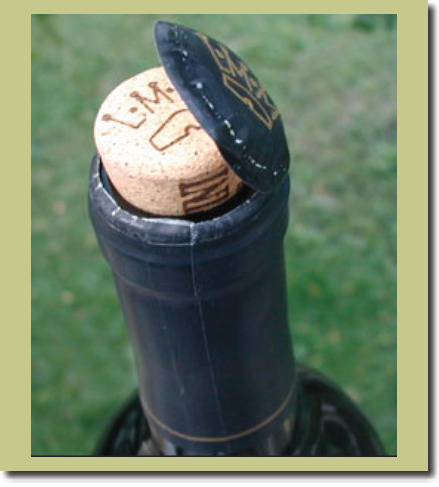 Another sign of heat damage is oozing of wine from the foil capsule and a lowered fill level, although this can also be due to a faulty cork. Also, visible wine along the length of the cork or on top of the cork while it is still in the bottle can suggest possible heat damage. Sadly, once a wine is damaged by heat exposure, no recovery is possible. Interestingly, freezing wine is not damaging in the near term.